These little pies are so delicious. The combination almond meal and honey in the crust give it a graham cracker taste, but far more sophisticated. 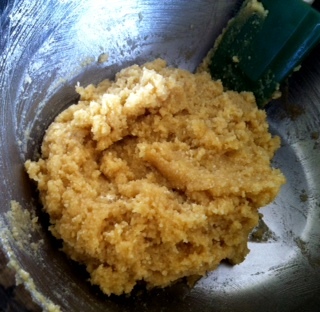 The dough is very forgiving to work with, if it cracks, just push it back together. Once you have patted them into 6″ circles, they can remain in the refrigerator for a few days – so easy to assemble and bake right before serving. This recipe makes four mini galettes. Divide the dough into four portions and roll each into a large ball. 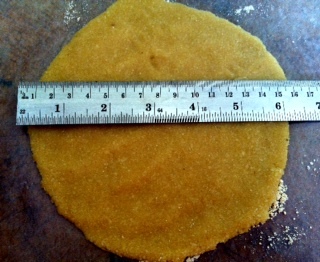 On a piece of waxed paper, using your hands, pat the ball into a 6 inch circle, using just a touch of additional coconut flour to prevent sticking (about 1/2 teaspoon each). After all four portions have been flatten, stack them (covering the top one) and refrigerate for at least an hour and up to a few days. Place a circle of dough on the lined baking sheet and pull away the waxed paper. Cut the peeled and cored apple into very thin slices. Arrange them in an overlapping fashion on the dough until you cover the center of the dough leaving a one inch border (you may have leftover apple slices). Fold the one inch border onto the apples and dust with cinnamon sugar. Preheat the oven to 325 degrees and bake for about 25 minutes or until golden brown. Melt the 2 teaspoons of apple jelly in the microwave or stove top until liquid (20 second intervals). brush the top the galettes with the melted apple jelly. 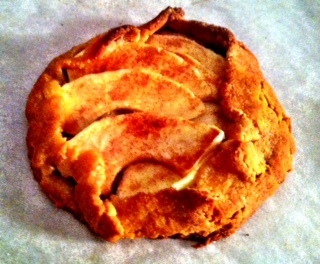 This entry was posted in Recipes and tagged Almond flour, Apples, dessert, galette, Gluten-Free. Bookmark the permalink. P.S. I talked to Barney Martin on the phone a month back. It was great to catch up! And so very, very gluten/wheat free! Thanks Emily! Not only is this recipe gluten free, but also grain free, but you wouldn’t guess that by the taste or texture. Very easy to make the dough well ahead of time and make right before serving.